Aria loves to do anything crafty, so this year it was really fun to get her to make the invitations. We went to the dollar store and bought doilies and jewels with stickers on the back (way easier than trying to glue them all individually! ), and Aria decorated all the butterflies by herself. 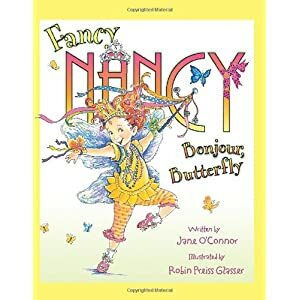 We borrowed the idea from Fancy Nancy herself, from the book "Bonjour Butterfly". Lately she's been drawing pictures for everyone she knows on post-it notes. Its really neat to see how she is gaining more control over how she can colour and draw. She tries REALLY hard to stay in the lines when she is colouring, and when she draws, she tries to draw things (like a smiley face or a pig) instead of just scribbling. My baby's growing up! Its crazy to think that in a year and a half she'll be starting kindergarten! Where has the time gone?